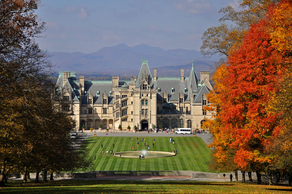 This morning, after breakfast, we’ll start with a historic tour of the Biltmore Estate & Gardens. Step into a world of beauty virtually unchanged for more than a century. The main house on the estate, is a Chatequesque-style mansion built by George Washington Vanderbilt II, between 1889 and 1895. It is the largest privately owned house in the United States, at 178,926 square feet of floor space and is still owned by George Vanderbilt’s descendants, standing today as one of the most prominent remaining examples of the “Gilded Age.” After touring the house, you will have time to visit the gardens, stroll acres of formal and informal gardens designed by America’s foremost landscape architect, Frederick Law Olmsted. From the beauty of the Italian Garden to the breathtaking trees in America’s first managed forest, to the Rose Garden with more than 250 varieties. Then visit the Biltmore Winery where you delight in free wine tastings and a redesigned self-guided tour to learn how to make award-winning wines. You also have time to browse & Shop Antler Hill Village. Stepping into the everyday lives of families who lived on the estate raising livestock, tending crops and working at Biltmore Dairy in the 1890s. The Barn in Antler Hill Village – once the social and work center for these families – is alive again with blacksmiths, woodworkers, and other craft demonstrations. The Barn Door features a unique selection of American made arts and crafts items and a Smokehouse offering Carolina barbeque, quick sandwiches, and other Southern favorites. Deposit of $200.00 due upon reserving.